Is it time to kick your Facebook addiction? This January many people are quitting Facebook. Research by Facebook and Cornell University shows how strong the addiction can be and shows common pitfalls. Here are some tips to avoid them. January is traditionally a time for people to look at their habits and try to make an adjustment for the better. Millions of people stop smoking or join a gym. A growing group of people is also looking at their excessive use of Facebook. Is it really benefiting their sense of well-being or is it actually detrimental? This question is central to the experiment hosted on 99daysoffreedom.com. It was created by Just, a Dutch creative agency, in a reaction to controversial social experiments that Facebook themselves had unleashed on unknowing users. 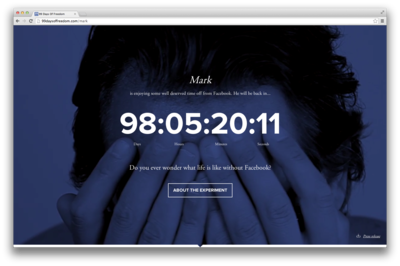 The challenge: quit Facebook for 99 days and monitor how it is affecting you? How hard can it be? A recent article by The Information reveals that Facebook has done research to determine the threshold for Android users to ditch Facebook. They did this by deliberately crashing the Facebook app. The company found that users, while frustrated, always kept coming back, opening the site in their mobile browsers instead. A newly published paper from Cornell researchers, based on data from the ‘99 days of freedom’ project, explores common pitfalls. This gives people trying to quit a few pointers how to be successful. If you perceive yourself to be addicted, it’s harder to kick the addiction. Your mind is playing tricks on you. Believing that you can actually do this, makes it easier to succeed. And, according to many of the participants that managed to quit the full 99 days, it is much easier to stop than anticipated, anyway. If you used Facebook to actively manage your image to others, you’re more likely to return. It’s tempting to want to portray a sunnier picture of yourself, than reality warrants. Realize that many other users do exactly this and take their shiny, happy lives with a grain of salt. Let go of how you want to be perceived and just be yourself. The happier you are the less likely to return. Quitting Facebook leaves you with more time to do fun things. Make that portrait, go on that hike, talk to your friends directly. For many users quitting Facebook is just a simple first step to make their lives more meaningful. Those who used other social media, were less likely to return. It is debatable whether substitution really is a solution, but if it might help you to slay your addiction one step at the time. If it makes you feel better, keep it up. A bonus tip from the forums: replace your Facebook bookmark with a link to your personalized counter. Each time you click on the icon you’ll be reminded how far you’ve come already. Additional research, based on the data from the experiment, will be done in 2016 by Leiden University and Vrije Universtiteit Amsterdam. They will look for personality traits that make people successful and see if participants are capable of predicting the effect of the experiment correctly. 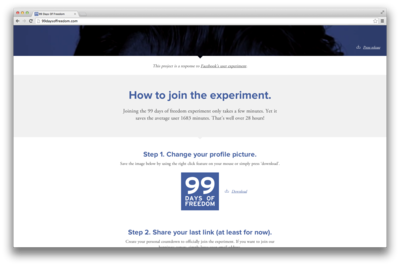 Subjects will be recruited among the new sign-ups to the 99 days experiment in order to provide an accurate baseline. Can crowdfunding help this mother find a new kidney? Razia Santoe has only 2% kidney function. She is on a waiting list for a transplant, and has tried desperately to find a suitable donor in her family and through Facebook. With no success. This summer she was put in touch with an ad agency, who developed a new kind of crowdfunding campaign for her cause. New Facebook mood experiment asks, "Are you happier without Facebook?"